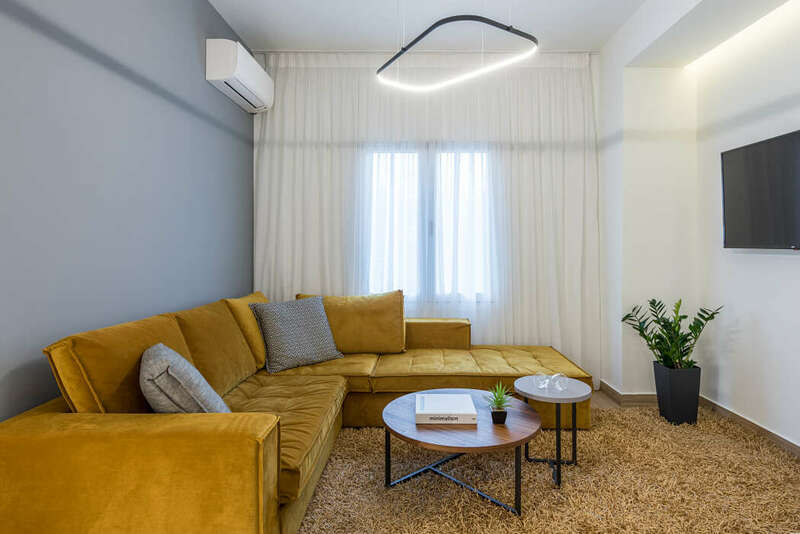 Redesigned by A+M Architecture, this modern 700 sq ft apartment is located in Kallimarmaro, Athens, Greece. The under study apartment with a total area of 65 sq. M. is located in a typical block of flats dating back to 1950s, near the center of Athens and the Kallimarmaro Stadium. The design?s main objective was the reformation of both functional structures and aesthetics of spaces in order to meet the modern needs of the owner. Regarding functionality, spatial organization was redefined – so as to serve the apartment? s new character (AirBnB) – by minimizing movement areas, consolidating everyday spaces and creating extra bedrooms. In this direction, the kitchen, bathroom and living areas are transferred, and in their places the kitchen and food areas, the main bedroom with an internal bathroom, a secondary bathroom, laundry and storage spaces were redesigned. Existing bedrooms were maintained in their original spots. The primary goal of the design was the creation of spaces of high aesthetics and quality. Particular emphasis was placed on the materials? textures, illustration and lighting. Tiles with three-dimensional reliefs and hidden lighting above headrests attribute complexity and warmth to the bedrooms, large-scale marble tiles and linear hidden lights give a sense of luxury and hotel character to the bathrooms, smooth lines and neutral colors in the kitchen and dining areas compose pictures of relaxation.